We adjourned form our busy day just as it was getting dark, a very productive day at Rock HQ saw progress in the garden, Rene got cleaned for the first time in one year of ownership, all the animals were cleaned out and brushed/groomed/fussed. Poppy pictured above caught a Lion sneaking up on the horses. The pigs had a wild time running around the garden before being spotted when they high tailed it back to the pen and tried to eat my boots as we had a bonding session. We were asked the other day how our animals are so friendly and get on so well. Well they have to, we haven't the time or resources to solve disputes so they all bump along nicely and all come to us when called. Well usually, Trevor bucked the trend and demonstrated more Houdini skills jumping fences and racing round to the Technohermits pad. Trevor is not the only one to be sensing spring at Rock HQ, trying to mount Tracey as she filled the water buckets was definitely a bad move on his part, she is thinking of booking the vet to geld him and quell his amorous advances. Back to the point, killer in our midst, we had finished for the day and the two punctures in the wheelbarrow wheel were fading into minor irritations as we reflected on the progress made. Delicious smells of a rabbit poaching on the rayburn added to the indicators that the day was over as far as work was concerned. But as any smallholder will tell you, you never finish, you just run out of time or energy or daylight. So while we had a a well earned cuppa planning future days, how the garden is going to be laid out and so on,Tracey heard something and told me to shush. Chickens. Noisy frightened chickens. The only job left was to shut the birds away and as we came into the cottage just as it was getting dark there were still a few diehards wandering around refusing to go to bed. Experience has taught us not to try and get them to go to bed early, the more you try to get the last few to their roost the more come out to see whats going on. Our battle with the foxes of the hill continues, last Thursday night I got a few blank shots off against two dog foxes fighting over a vixen in the field opposite the cottage. For a few weeks now we haven't lost a bird. The ominous sounds outside convinced us one or more of the birds was under attack. 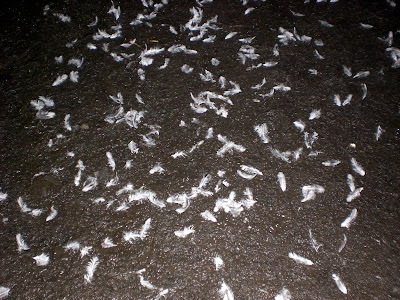 Tracey got outside quicker than I and was confronted by a sea of white feathers in the yard, to her left between the stable and house the sounds of a chicken in distress. 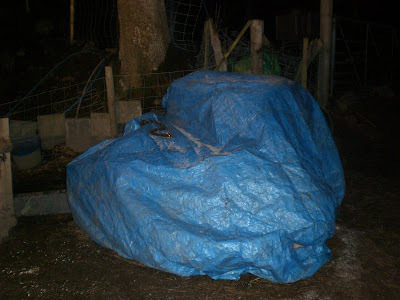 Tracey went towards the sound and in the torchlight found one of the white hens horribly injured against the fence. Despite deep wounds it was still alive and a trail of feathers led from the hen house some fifty yards away to its current position. She was lucky, whatever it was that was going to eat her had missed its chance. Sat watching just few feet away from the critically injured hen was Kitler. Kitler is a feral cat we always feed when we see him. Called Kitler because the black patch on his white fur on his head looks like Hitlers hairdo thus he is named Kitler. We have always wondered how he is so fat. Until tonight we assumed he had more than his fair share of rabbits on the hill and that his diet was supplemented by a few soft touches like ourselves. But the feathers were a giveaway. Kitler is a chicken killer. Luckily for Kitler the only thing to hand was a plastic food scoop which totally lacks aerodynamic properties but somehow managed to hit the smug cat as I threw it across the yard. Kitler will now be treated the same as foxes. No more free breakfasts. Yes, today I am incredibly happy. The cause of my happiness is not as you might suspect the pint of Lancaster Bomber beer I am drinking now, neither is it the anticipation of the cheese and onion sandwich that I am about to eat for my supper. No, its a much deeper happiness than that. I'm not happy because I have had an excellent day at work where I met an old colleague from way back who helped me mightily with a project. No. The fact that I got our now dreaded monthly visit to the chaos and depression of the supermarket over in less than an hour without suffering panic attacks as the various necessary purchases were rung through the till did momentarily lift my spirits but did not in essence make me happy. In fact getting the evening round done without being mugged by the Ryelands or pounced on by the psychotic goats only added to my sense of well being, but did not instigate this feeling of overwhelming happiness. What usually causes me to smile is the symbolic raising of the drawbridge on a Friday night. Closing the gate at the end of our dirt track always feels good, especially when you know you have at least 48 hours on the smallholding ahead of you. But tonight was special, tonight shutting the gate meant something, it had a significance. Tonight as Tracey shut the gate she did it in daylight, the first time in daylight on our return from work this year. Our days are getting longer, soon we will be able to work outside when we get home without the harsh glare of the anti aircraft lights. We will not be confined to the yellow field of light that restricts what we do. 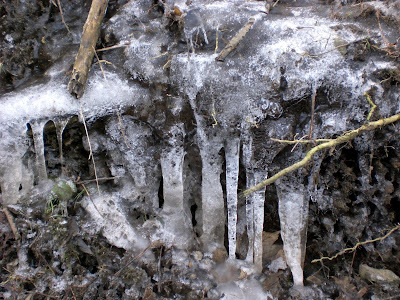 Despite the severe weather forecast for the start of next week spring definately on its way. This is Preston, a 16 year old beagle posing on the bank by the reservoir. 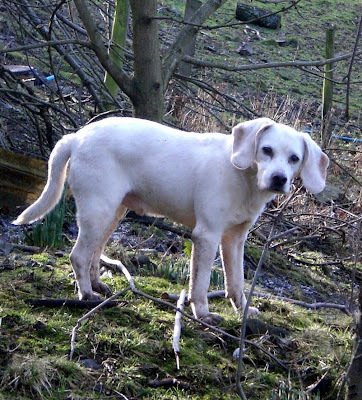 He might not look his 112 dog years but the very fact he is white shows his age. He used to be whats known as lemon and white, a lovely honey brown and white coat, but over the years he has faded to his present shade. They used to live with us in a small kennel and run at our old house but now they have free run of the smallholding and get to play in a back yard that extends for thousands of acres. 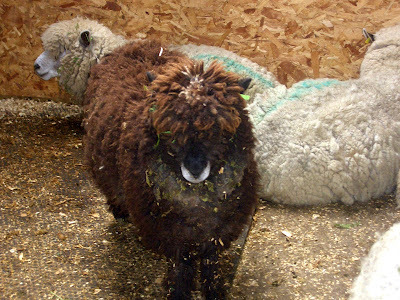 Once they got used to the killer sheep, the psychotic goats and a shitland pony with SHS they found fourteen types of pooh to roll in, ditches to sit in and barns to curl up and sleep in. Preston and his sister Passion are enjoying their retirement here at Rock HQ and usually keep out of trouble! Sometimes life here borders on the surreal. Tracey and I divided the jobs up tonight rather than working together as usual, we felt that if we missed out our quality time together mucking out the horses we might finish the evening rounds early and sit down to a leisurely cooked dinner rather than one bolted on the hoof. As we are also keeping tabs on the Technohermit by giving him two cooked meals a week it fell to me to deliver his share of the delicious chicken stew to his lair before I could finally sit down and eat mine. I was late but he was happy to see me, pleasantries were exchanged, he was keeping dry, having trouble with his feet though which he offered to show me. Having seen more than I would have wanted to of his anatomy when I surprised him on the hill crouched in the bracken last summer it was an offer I could refuse. I asked if there was anything I could get him from town. Well there was but he didn't think I would go to those sort of shops. My mind did somersaults trying to work out what sort of shops he would use that I wouldn't, was there a specialist hermit shop? "Well." He scratched his bristles on his chin "I don't suppose you go to Ashbys"
The name didn't ring as bell but it sounded like a shop that sold useful things hermits might hoard like anything shiny, or mantraps. "Its in the High Street." He meant the supermarket, so I look like someone who doesn't use supermarket, must be the sheath knife. "Well its on special offer I believe! "Big like this they are" he held his hands apart like a fisherman boasting. "Hard to carry on the bike"
"Yes can you get me some?" Cant beat the real thing I thought as I wandered back down the lane. Its hard to tell that we spread 40 ton of gravel on the yard in the "summer". Torrential rain has turned it back into a sea of mud which the dogs and ducks are playing in. 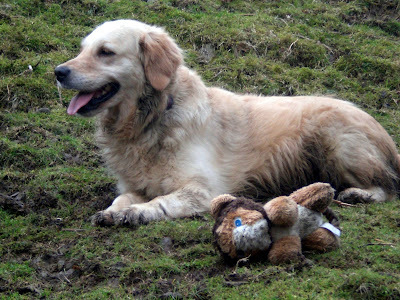 When you see dogs this size this wet and muddy you can understand why we don't have any carpets! Today my colleagues were concerned my ineptitude with a hammer had surpassed itself when I turned up at the office with a bright purple hand. Visitors to our HQ looked away thinking I was either a plague carrier or afflicted with a peculiar birthmark. Finally one of the team asked what had happened, was it a rash, no, I was treating footrot in a dark shed in the early hours and missed the target. He left my office chuckling that he might have known. Geisha still has footrot but as can be seen she is back on her feet and eating again. In fact she is helping herself to Apollos breakfast while he is out, well nature abhors a vacuum. Her feet are coated in purple antiseptic spray which I apply, or try to, every 24 hours. Hopefully with this amount of TLC she sill be back to her usual self and climbing on car roofs by the weekend. I was told the other week, by someone who knows far more about the subject than I, that horses have a natural aversion to Lions. Even with being the sceptic that I am I first thought that that was obvious, it followed natural logic, any horse with half an eye on survival would, presumably like any mammal keen on adding its genes to the pool would definitely be very cautious when faced by the King of the Beasts. Especially if it was close to dinner time. But then the inner sceptic kicked in, a question bubbled to the surface and required an answer, how does a horse based solely in the UK, who has never left these shores yet alone travelled to the plains of the Serengeti know what a Lion looks like. How on earth would they know they should be scared, and of what, I mean how do they recognise the danger posed by the mangy maned predator? The truth is they don't, horses therefore operate on the safe than sorry principle where the solution is to be scared of everything just in case its a Lion. 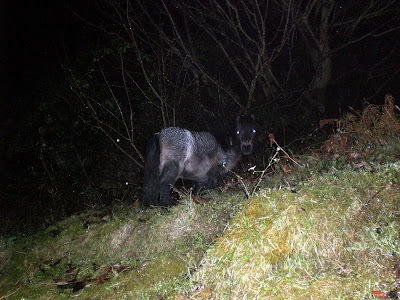 So tonight when I set off around the hill to see the Technohermit to deliver his bag of potatoes I took Apollo, the horsey looking one pictured above, to give him a bit of exercise and experience "the darkness" under my supervision. Now readers of these pages will know that I know as much about horses as I do about, er, well Lions I suppose, so everything associated with equine behaviour to me is part of the near vertical learning curve that I set off on once I decided that what I really needed on the smallholding was a trainee heavy horse to do a lot of the donkey work. No offense. 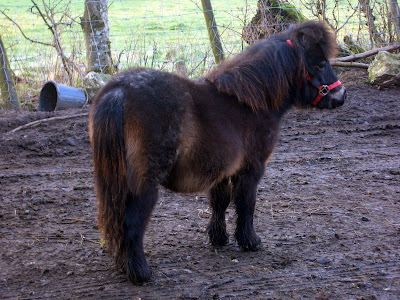 If I had been told just over two years ago that I would be wrestling a small pony in the dark rather than sat in a nice modern three bed terrace watching Sky on my 56 inch plasma I would have thought you mental. As I spent part of this evening more or less trying to coax him down from a tree into which he leapt because he confused a Rabbit for a Lion about to attack then it is I who is in need of medication and a straight jacket. Spuds in one hand Apollo in the other we set off with the magnificent seven down the track that leads to the Technohermits cave. The first Lion we encountered hooted suspiciously like an Owl which caused my less than brave little pony want to walk with his left shoulder wedged under my right armpit. A slight disparity in weight caused us to merry go round every twenty yards or so which made us obvious prey for the Lions who like sharks sense the fear. The second Lion shot past at the speed of dog followed in close formation by six others, Apollo convinced now that these were in fact the real deal reared up and then kicked me on the knee cap not quite hard enough to make me cry but hard enough. My soothing words (yes I have seen the horse whisperer) eventually calmed the frantic beast so much so that the next Lion, his hoof hitting an unexpected noisy patch of gravel only caused him to bolt and luckily I was ready for this so he only got as far as the length of the lead rope before he dived back under my armpit. Undeterred the Lions rallied and launched another attack, this time in the form of a puddle, the shock of which caused a near vertical jump that nearly left both pony and owner hanging from the trees. I kept up a monologue of calm words, had he understood English he would have known the words were in fact a description of what would happen to him if he carried on. We got to the Technohermits dwelling and once he was coaxed to the entrance I handed him his potatoes. 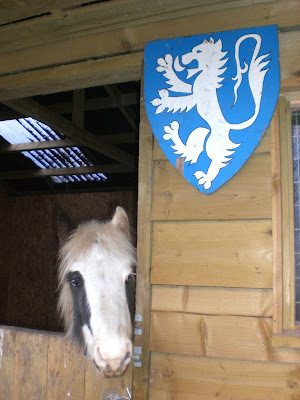 He rather cleverly noticed I had a horse with me who was now hiding right behind me just in case. Mercy mission done we were halfway, all we had to do was get back without more Lions finding us. Well inevitably they did in the form of a tree, a gateway, the Beagles, a star and my coat. When, finally, we entered the sanctuary of the anti aircraft lights guarding the stable we were both so traumatised by the preceeding 45 minutes that the sound of fox calling from the end of our lane (similar to a werewolf being castrated with rusty butter knives) neither of us reacted other than to stare at each other blankly as I shut his stable door. The temptation to dress up in a Lion costume or decorate his stable with appropriate photographs from The National Geographic to teach him the difference between predator and falling leaf were disaapated when as I turned to sort the magnificent seven, who were now mustering round the feed bowls, Apollo leant over his stable door and gave me the biggest wettest kiss on the lips its possible for a horse to give a man. Pixie is trying her best to stay the right side of pet status. She is still only half the size of Patches but twice as cute! Trevor met some very important people today and even though they promised him fame and fortune he didn't let it go to his head. He was on his best behaviour as they sat at the breakfast table eating Rock HQ bacon in Rock HQ baked bread (the ubiquitous bacon buttie) he trotted into the cottage and said hello, ate an apple, posed for a few quick photos and then went back outside. As usual the reaction on peoples faces when they see a miniature horse in a house is quite comical, its not something they see everyday. After breakfast Jess and Dave had a quick tour of Rock HQ and we answered lots of questions about why we live the life we do. All the while Trevor kept a watchful eye on Dave. You see Dave is a photographer and he was carrying a very expensive camera with a fairly massive accessory bag, which was kind of box shaped and from a distance probably looked quite like a hamster cage. Once Dave returned to his car and Trevor was sure I hadn't actually found someone who wanted to exchange a fat cheeked rodent for a stroppy horse who is a Cult he emerged from his hiding place kicked his heels and reverted to his more usual activities whilst in the garden, trying to bite me, chasing cats and robbing bird feeders. All in all the visit was a great success and we look forward to seeing the results. This is Apollo and as you can see there is a strange sort of purple haze from his shoulders back where the guarantee to turn your dirty pony white spray actually didn't and has left him a very strange hue. As he only sees in black and white hes not too bothered. Considering hes normally coated in his own pooh having a purple rinse is an improvement! 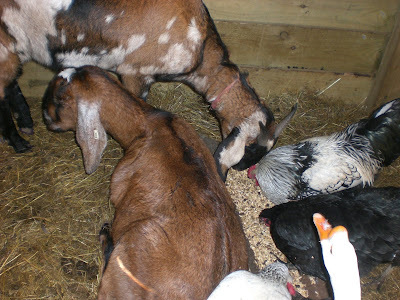 Lets get a fact about goats cleared up once and for all, they don't eat everything. They do however try to eat everything. The day you see a goat not eating is when Hell freezes over. 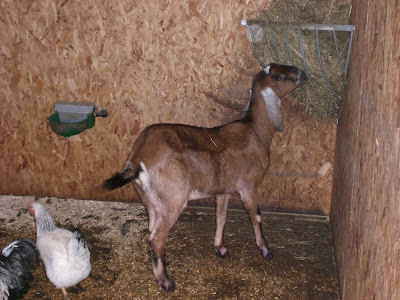 So the flames must have been at least dampened today as Geisha, our lovely pedigree Anglo Nubian Goat turned her back on the food. 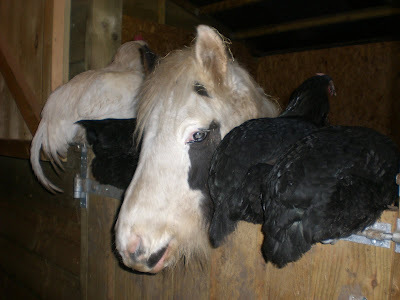 Even though her stall mate Maggie started to eat it all she refused even to look at it. still she persisted in her non eating.Clearly a non eating goat is a cause for concern and as our plans for milk and cheese are resting squarely on her furry shoulders action was needed to put her right. The cause of her loss of appetite was footrot. Hooves grow continuously like fingernails and have to be trimmed regularly to prevent their feet literally rotting away. Imagine the worst case of athletes foot ever, but with little worms in just to make it more interesting then perhaps you can appreciate why Geisha felt less like eating and more like crying. We have been trimming and checking her hooves weekly as we had noticed the onset of this horrible affliction but it just gets worse. No matter how many times I spray us both with the purple foot rot cure it makes no difference other than my colleagues at work giving me funny looks for sporting an unusual shade of purple nail varnish. What she needs are dry feet but given our climate and its propensity for rain that seems to be, well a real case of blue sky thinking. We have moved her to dry quarters and a dry bed on a dry floor where she rather pathetically just about managed a little piece of dry straw for lunch. A real case of A.N.D.Q! Purple was a bit of a theme today as we cleaned The Boys, giving them a good brush and generally tended to their every needs. 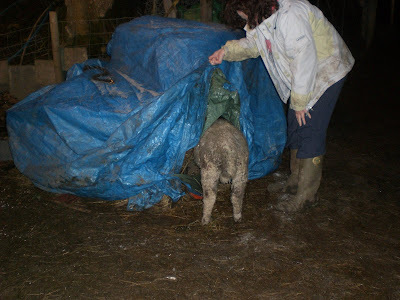 Its a strange thing smallholding, you spend most of your time making sure your charges are clean, dry and well fed while you on the other hand get dirty, wet and hungry. Anyway Apollo had done his party trick of rolling in his fresh number twos, turning him from a white to a sort of nicotine yellow with green splashes. No worries, we have a new weapon against the terror of pooh, a spray that is especially formulated to turn off white ponies back to radioactive white in just a few squirts. Unfortunately the manufacturers of this particular soap spray have not met Apollo and his pooh so despite following the manufacturers guidelines he didn't go white, first he went a dull grey and then a strange kind of purple rinse effect took hold, like an old ladies hair do. Luckily I only did from the shoulders back so passers by wont think there is anything amiss as this handsome Gypsy Cob whinnies hello. The phony war in the garden continues, masses of preparation work ready for the spring offensive. This is how it looks at the moment, the spring cabbages have survived Trevor's assault, the sprouts are over and the garlic is struggling but holding on. Cant wait until we can start doing proper gardening as opposed to trying to stop yourself slipping over on the death trap paving slabs or suddenly walking with one very cold and wet foot as you have left a boot stuck fast in the mud. This is Trevor our shitland (spelt correctly) inspecting his new bed, well you know what its like that clean sheet feeling, you just cant help yourself. I draw the line at eating it though! They are fantastic dogs but agility is not one of their strong points! However, if they get an idea in their heads you have a hard job convincing them otherwise. So today Rocky and Reba were in the conservatory, the bespoke redwood effort lovingly built by the nice man who sold us Rock HQ and they decided that what they wanted to do was go for a walk. I personally think they were egged on by Poppy the Golden Retriever who was with them. Anyway the dynamic duo shoulder charged the double doors leading into the garden and set off on a great adventure which was only curtailed when The Oracle spotted them harassing Mad Keith for crusts of bread. The Oracle being the good neighbour that he is walked them back presenting three muddy dogs to Tracey and Bethan who were enjoying hot buttered toast for breakfast oblivious to the mass breakout. 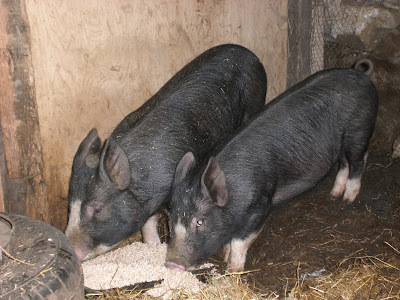 These are our Berkshire piglets venturing outside their new quarters for the first time. They were so excited they didn't know what to do, eat or run around, so they did both. These have achieved pet status so they are safe from being turned into bacon. They will however be expected to produce piglets for Pig Club. Pig club has two members so far. There are rules to Pig Club. The first rule of Pig Club is that you tell people you are in Pig Club. The second rule of Pig Club is that you TELL PEOPLE you are in Pig Club. There are other rules, watch this space, but so far we have two members in Pig Club. We are often asked where would we be without our animals. Sitting on a beach in Antigua is my usual response given the costs involved, but seriously, whilst we might be richer financially we would be a whole lot poorer emotionally without our eclectic gang of dependents at Rock HQ. It had been a busy and interesting day at work, Paul confirmed that the business plan to win the lottery and pay the mortgage off was one step closer to success with a ten pound win ready to be frittered away on more tickets, and so paid work day over we set about tending to our smallholding. Despite a cold wind knifing its way through the gaps in my gortex jacket which made the prospect of a sun drenched Antiguan beach seem just a tad more appealing than trudging through slush and mud whilst trying to protect my self from the hailstones all was well in my world. The horses had got over their high jinx of the weekend and were genuinely pleased to see me, at least they were interested in me until their dinners were laid out before them, then they were only interested in getting their noses down. William did have a moment of panic when I couldn't undo his padlock and had to leave him greedily eyeing his bucketful as I tried to find the ubiquitous WD40. Mucked out and well fed they had a few minutes each quality time before I set off to walk the dogs down the lane. Fate was smiling on me, in the darkness I managed to find the torch I dropped in the lane two days ago, a quick rattle and an optimistic press of buttons and it emitted its pathetic finger of light skyward. Now I had a torch I could check my favourite time wasters the piglets. They were top to tail in the deep straw bed, very content and very asleep. Up on the bales of hay I found a nest of eggs, a Black Rock hen clucked noisily as I took them. Fantastic, fresh eggs are in short supply this time of year at Rock HQ. As I walked back up the track a shooting star flashed overhead, this evening was getting better and better. All jobs done I took the dogs to the kennels and dished out oversize portions of dog food to the magnificent seven. I went past the ever diminishing hay stack again to turn off the anti aircraft lights. It made a noise. Not the noise you usually associate with haystacks, as a rule bales of hay are fairly quiet. These weren't. These definitely went "Baaa". Nothing looked out of place but after a cautious investigation that involved me prodding strategic points with my boot I discovered the culprit. Given the weather it seemed a shame to evict from his cosy hidey hole. He really milked the sympathy vote as he stomped off towards the Cauldron to find the rest of the flock. Horses can help in the garden in so many ways! Heres a game, run up and down the hill everytime your owner tries to get you into the field. Great fun, especially if your owner is in a hurry. Unfortunately for Apollo I had to resort to applied animal psychology and extreme violence to resolve this one. A text book rugby tackle and the game ended. Its been a busy day at Rock HQ and despite the efforts of the animals to derail the plans to get jobs done all tasks set by humans on the smallholding were completed and had Trevor not reincarnated as Houdini at last light we would have got back indoors before getting soaked in the current deluge from above that is now flooding the workshop. The horses, collectively known as The Boys, were turned out first thing. 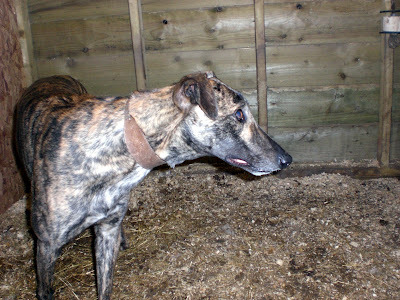 Trevor has been out all week as Bailey the rescue greyhound needed his crib. William and Apollo were in need of a leg stretch and were put on Willow Rise, there is absolutely no grass but at least they can exercise. William entered the field with no problem and spent about half an hour running round like a lunatic until his batteries ran out and he turned his attention to the anthills in the hope that they might have a bit more grass on than the rest of the field. Apollo on and in the other hand decided he wasn't going quietly through the gate and set off at a fast pace uphill followed by an even faster pace back downhill. And so a very interesting game began where he ran up and down the the hill pausing just out of arms reach where he became very interested in a clump of bogwort or a narrow leafed plantain until I showed any sign of movement which provoked more equine speed displays. The show finally ended when I risked life and bionic left arm by rugby tackling him as he passed, suddenly having my weight attached to his neck caused a rapid change of direction and whilst I didn't actually floor the beast he found himself running in an ever decreasing circle and was unceremoniously shoved through the gate where he joined William examining anthills. Without these two timewasters in the yard we were able to get on with an assortment of tasks which included introducing Bailey to someone who will hopefully turn out to be his new Mum, Dawn. 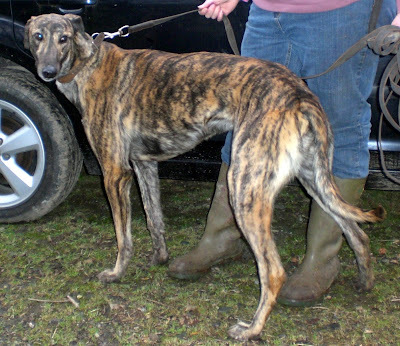 She arrived with her son Sam and we all went for a walk with the brindle greyhound. Having briefed Bailey on the best techniques for impressing new owners things got off to a flying start with him planting the worlds muddiest paws on Dawns clean clothes and then sticking his muzzle into Sam's crotch. As we walked down the lane he gave a spectacular display of dog with upset tummy, the bright orange diarrhea could have been straight out of Van Gogh's paint set for Sunflowers, the shade and consistency was perfect. Having failed to win her over on the walk Bailey was given a second chance on the indoor obstacle course test. Her comment "Is this the clumsiness you spoke of" as he clattered through a series of framed photos, cups of coffee and assorted furniture. His piece de resistance was chasing a cat up the stairs. The whole episode seemed doomed as Dawn, Sam and I sat making polite conversation about how nice well behaved greyhounds are when Bailey returned from his sortie with the cats, wiped the fur from his muzzle on Sam's trousers and looked at me suddenly poleaxed, somewhere in the dog hind brain he remembered his purpose in life, and if he still wanted one he would have to ingratiate himself into these new humans home. 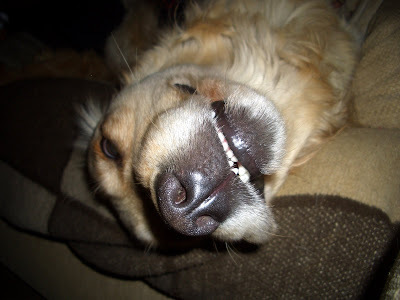 The most appalling display of fawning began and as Dawn warmed to the great hairy rat like hound he dispensed with all pretence at maintaining any dignity and rolled onto his back to have his tummy tickled. This was a complete masterstroke and she agreed to have him. 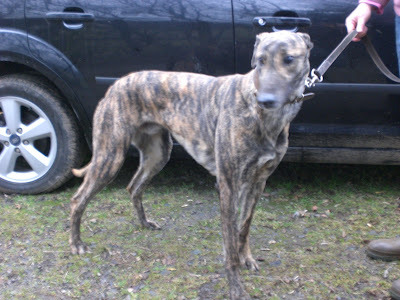 He is now back at the kennels where he will go and see the vet to be castrated. Its a high price to pay for new home but long term he will think its worth it. Much work was done in the garden, many barrowloads of horse do was moved and raked over the raised beds, Trevor in a demonstration of what was to come much later negotiated the goat proof fence and whilst I was busy doing the garden he was busy with his version which included munching the tops off the spring cabbage, stripping the last stalks of sprouts and trampling the garlic. He did however redeem himself by munching through the weeds that had taken over the "spare" bed thus helping clear the way for spring. 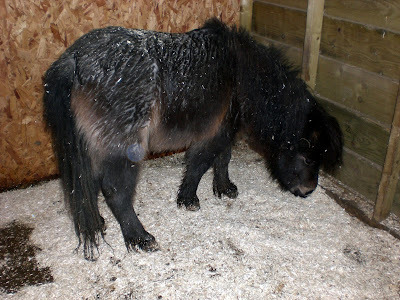 His stable disinfected and refurbished he eagerly trotted home and rolled in his new bed. The day was almost done. William and Apollo were fetched and put in their stables, it was just a matter of rounding up the birds and feeding the dogs and the evening was ours. It was dusk, foul weather approached across the valley, timing was to perfection. It was then that Tracey just checked on Trevor whose stable is at the back. In a masterpiece of understatement Tracey said, "You are not going to believe this but Trevor's gone"
Now both Tracey and I are certain we bolted him in, I even spent several minutes filming him rolling around his new bed yet somehow the stable door was wide open. Little hoof prints showed his direction and speed. Half an hour later on the other side of the hill we found him in almost the exact same spot William and Apollo were found a week ago. Don't try and tell me they don't goad each other on to wind us up. Inside Rock HQ I checked the classified adverts in the local paper, so far no one seems to want to swap a hamster for a shitland pony. Its been a right week at work so it was good to shut the gate at the end of the lane and look forward to a weekend of fun at Rock HQ. All jobs are done, well, all routine jobs are done, they are all fed and watered as are the human inhabitants and now we are in the calm before the storm, its going to be a busy one, one where we hope Bailey gets a new home. Until it starts at first light we are all chilling out with Poppy above leading the way! After a busy day at work you return home and you have forced yourself to leave the warm cottage to endure pouring rain to feed the horses, shovel their pooh from one end of the smallholding to the other, checked the goats are alive and well safe in their beds, walked the dogs, shut the birds away, fallen over checking the reservoir is full of fresh water, made sure the lambs and pigs are where they should be, done a quick head count of the sheep several times as they are moving around because seven dogs are racing up and down the lane got a bucket of dog food from the feed store the very last thing you want to see out of the corner of your eye as you gleefully head back to the warmth of the kitchen looking forward to the beef and ale pie you know your beautiful wife is cooking for you, really, I assure you the very very last thing you want to see is this little monster heading off up the cliff at the back of Rock HQ. He is adorable but sometimes I would swap him for a hamster! These are our Berkshire piglets grazing for sheep nuts alongside the Ryeland lambs, the largest of which is Daffodil who was bottle fed and the only survivor of the four bottle fed lambs from last spring. Patches confirmed a rule of smallholding first thing this morning, that an animal can get itself through a hole half their body size. Well she confirmed a variation of the rule actually and by the time I found her she was a good way along the road to piggie heaven. Her neck is thicker than my thigh and somehow she managed to get her head through a hay net hole some four inch square. Where she had dug this up from remains a mystery but it was clear from her distress and difficulty in breathing that unless some help was given soon she wouldn't need any help at all. Worse still she had twisted the rest of the net around her body, it was dark and to top it all I was carrying a bucket of pig pellets. For a moment hunger overtook panic and she lunged at the bucket tripping over in the mesh and tightening the grip around her neck. I usually have on my belt a sheath knife, in fact I am so used to carrying it I wandered into town last weekend with it still attached. Halfway down the highstreet I realised and spent the other half conspicuously pulling my coat down over my buttocks to hide the offensive weapon. Actually given the locality I could have pulled it out, brandished it around and no one would have batted an eyelid. Anyway back to the pig in crisis, she lying on the floor of the sty squealing wrapped in the net like an extra in Gladiator, me knelt over her with my huge weapon drawn, looking much like Russell Crowe, trying to find something to cut in the dark. First wild stab in the dark and I was grateful I had not ever sharpened the blade as I sliced a chunk off my finger. I managed to get the blade between pig and nylon cordage of the net and began to cut her free. Patches did not react like the Aesop's fable lion caught in the net freed by the mouse, she did not lie still patiently waiting to be released. I suppose it might have felt like I was strangling her as I pulled the blade and sawed back and forth. 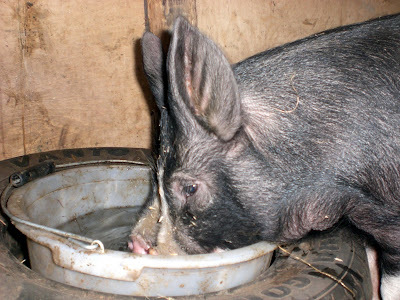 She went mental, and squealing erm well squealing like an about to be stuck pig bit my already bleeding hand and suddenly free of the net ran around the sty shouting her contempt until she remembered the bucket of feed, dived in and consoled herself with food. Gratitude is not one of her traits. If you want gratitude get a dog. I took Bailey for a walk tonight and was pleasantly surprised at how good he was on the lead. No pulling whatsoever, walking absolutely to heel with his nose against my leg. Completely different to the other day when I took him and he was all over the place. I looked up at the clear starlight sky and named the usual suspects, Orion's belt just showing on the horizon, the Little Bear, The Plough and then it dawned on me why it was so different. Bailey is a real long dog. We were in the dark, I had an apology for a torch and Bailey thought he was going to work. He had been found running across open countryside a couple of weeks ago with no I.D. Given the way he was on the lead in the dark with a lamp he is a poachers dog, a long dog used for the hunt and somewhere there is a poacher cursing his luck. It might come across sometimes that I consider all our stock as meals on the hoof but there was a time I was a vegetarian, yes by choice and for quite a while, around five years and I was cured dear reader by the Royal Navy. Sara who was here only a week ago, seems like longer, is also a veggie and we had a veggie meal, a lovely vegetable casserole with cheesy scones, tomatoes and mozzarella with chili beans. Altogether delicious, admittedly it would have been better with a thick Rock HQ Berkshire pork chop with a chili glaze but for one night I harked back to old times and ate a meal that hadn't been eating a few weeks before. Why I became vegetarian was as a result of watching a documentary about intensive pig farming, the squalid conditions these poor animals are kept in turned my stomach and from that day on I shunned all meat unless I had hunted or killed it myself. This meant that in the not quite five years I kept this pledge I only ate one pheasant that I accidentally run over. It was quite a chase, up the grass verge through the hedge and across four back gardens but eventually I got it. 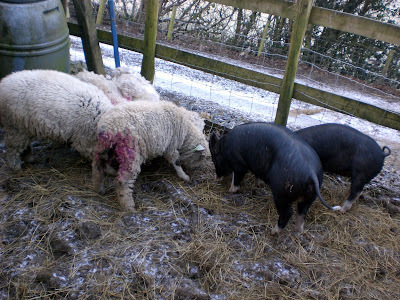 One of the primary reasons for smallholding was to ensure we knew where our food came from and that any animals we kept for meat were kept in conditions where their welfare was ensured and they led happy if somewhat shorter than natural lives. So well cared for, and as a result so tasty the meat some of our friends who have been vegetarians for years, like Sara and Kay have been tempted to try some of our pork and bacon. 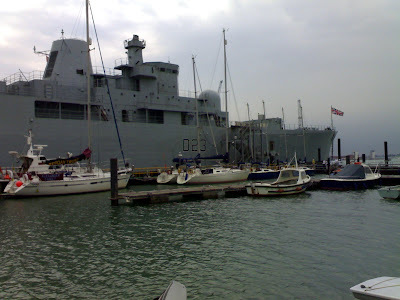 How the Navy cured me was while I was on HMS Norfolk I had a dinner. I was for years a reserve officer, I have in fact only just resigned my commission as my arm will never repair to a level that I could carry out my role, a rescue coxswain. Whilst you can drive a boat with one hand hauling boats in and out of water demands two arms, hauling wet sailors out of the sea requires a crane! Anyway for some reason as I went past the galley I smelt the cooking and asked the chefs what was on the menu. Lamb chops. I explained I was a vegetarian. They laughed. The smell was overwhelming, I asked for a plateful. Three platefuls later I was cured. 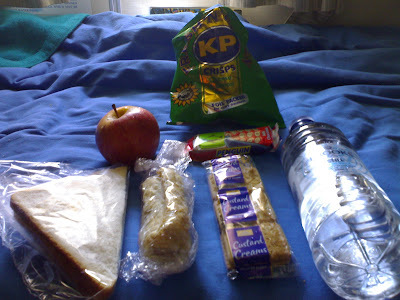 I will miss the Navy and the scrapes and adventures I got into, accidentally having dinner with Prince Andrew was one of many weird days, I wont however miss the the lunches they gave us, pictured below, prisoners got fed better! Ever wondered how horses stand up? Apollo was exhausted after his little adventure around the hill on Friday night and spent most of Saturday asleep, not standing on all fours nodding type sleep but proper lie down on his side fast asleep. After today's efforts I know how he feels. As always we had the routine to attend to, pigs got fed, sheep got shouted at and fed, goats had their bad behaviour ignored and fed, horses were mucked out and fed, all were watered, dogs were walked and wheel barrow loads of muck were taken along something akin to an assault course for wheelbarrows to drop off horse business onto the raised beds. 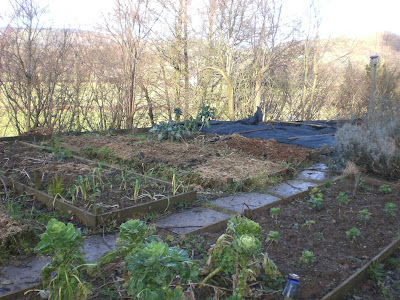 This should rot down over the next few months, the worms will have a party and it will also raise the temperature of the ground a bit, especially with a layer of black polythene type cloth over it, it all looks really neat and tidy for a while. All this effort soon attracted the attention of the Ryelands and Apollo the wonder foal and a fairly accurate reenactment of Custer's last stand took place in the gateway as I bravely fought off the horde of sheep led by a pony and prevented them entering the hallowed ground of the garden. Roxy being especially quick did manage a ten yard incursion but I managed to wrestle her along the path and eject her to join her comrades. 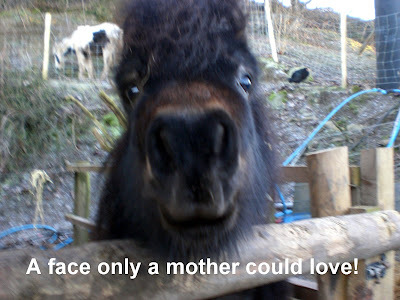 Geisha looked miserable and was lying down, a quick look at her hooves and she had a minor spot of footrot. So started a mammoth chiropody session for all the sheep and goats. Maggie being armed and dangerous was the most trouble but luckily her feet needed the least amount of trimming so saving us being gored on her horns. My chest still bears the scar from the time we simultaneously tried to lean into a feed bin. In her panic to get out her horn punctured my jacket and gave me a very fetching wound. 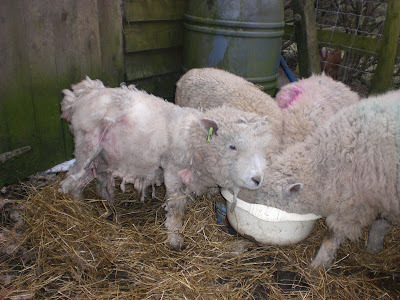 Both sheep and goats have hooves that continually grow, left unattended they fold over on themselves, collect dirt which rots and so the poor beast gets an infection which unchecked cripples them. So two or three times a year we open the chiropody clinic and shortly after I go to see the chiropractor to have my bad back put right. 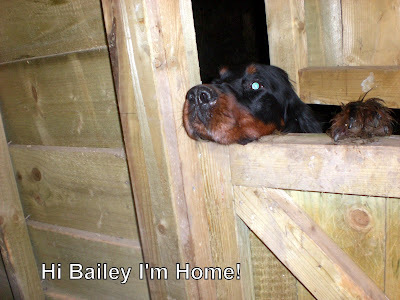 It looks like Bailey has a new home to go to, just as well as he has a fondness for our ducks and the cats absolutely hate him, poor lad. I think Greyhounds are a bit of a Marmite dog, you either love them or hate them. Bonny continues to thrive, she looks a mess but since the scary night when we thought she, Sandy and Katy were about to shuffle off their mortal coils she has gone from strength to strength. As you can see she has lost most of her wool from the fright she had when attacked by the dog fox. Final update, Patches continues to win the battle for supremacy in the pet status race over Pixie, she continues to be twice the size and twice as friendly. All in all, what with getting Beth a different car, The Stable Sprite and his wife coming to dinner and taking Mad Keith a Sunday roast it has been a packed weekend at Rock HQ. The big freeze continues here at Rock HQ, minus 7 last night, and the spring that serves as our water supply for the animals is solid ice. We have a fairly complicated water supply here, the cottage is served by a bore hole which is below the level of the cottage so the water is pumped up to a reservoir and then gravity gives it enough pressure to feed into the house. It was this pump and reservoir system that froze meaning no water at HQ for three days. Our friend and electrician brought us over a barrel of fresh water which lasted us until the pipes thawed. The animals and garden are supplied from a spring and stream system which we put together collecting 800 gallons in three separate tanks. 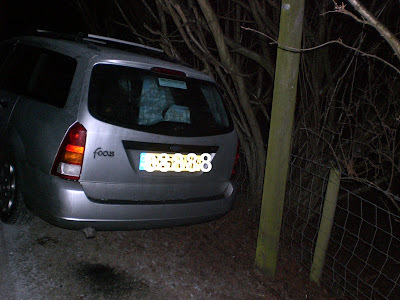 It would have been 1000 gallons but if you trawl the archive you will find a tale where Ben jumped out of the way of a 500 gallon tank when we tried to move it and as we are on a steep hill it rolled until it met the landrover putting a hole in it at the 310 gallon mark. The water runs along various pipes to a motley collection of taps and thus the little animals get their supply. As its all solid they are all on short rations supplied by buckets from the well, yes there is a well in addition to all the other water outlets. The well was dug just before the borehole but put in totally the wrong place and could not be connected to the cottage. Hence the borehole.Patches let me know how thirsty she was this morning by running around with an empty bucket in her mouth, the other bucket was solid ice. I dutifully returned to Rock HQ for fresh supplies which were gratefully received. In fact she was so thirsty she ignored her food and dived straight in to the clean bucketful. Well tonight I did have half a plan just to do a quick couple of lines about Trevor and his fat balls. But as usual event overtook this smallholder who is home alone, aside from 60 or so beasts and Beth with her boyfriend Tom. Tracey is at her Mum and Dads because her Dad is still very poorly. So I was lucky enough to be driven home by Beth who models her driving style on a blindfolded Mr Bean, this time the journey passed without incident and I at no stage felt compelled to grab the handbrake or scream hysterically as she approached every junction. Back at the ranch I intended to complete all jobs and then get the house not only tidied but completely redecorated before Tracey came home. First job was to muck the boys out who had each dumped a wheelbarrow load of fresh do all over the stable floor. As they have both got used to standing quietly having a munch from the ever decreasing haystack I let them both out for that purpose. I should have paid more attention to the mood of Apollo who was fizzing like an unexploded bomb. Whilst I was moving the latest offerings from his bowels he went off, down the lane at full speed disappearing into the darkness. William and I stood and waited. Soon the reassuring clatter of hooves heralded the wonder foals arrival. William chewed thoughtfully as Apollo circled him in the glow of the anti aircraft lights. They stood shoulder to shoulder facing down the lane, William looked at Apollo and nodded and both took off down the lane Grand National style at full gallop. No reassuring clatter of hooves. They had whats technically known as done a runner. I got my less than useful torch and with the Magnificent 7 in full cry set off after them. Precious few signs were there for an experienced tracker like myself to follow but judging by the hoof prints in the ice sheet at the bottom of our lane they had obviously considered turning for home before heading off up the hill towards the Ghost House and Mad Keith's. 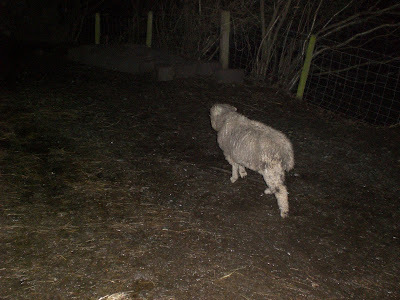 My spirit lifted slightly when I thought the torch had picked out Apollo but it turned out to be our sheep who panicked in the darkness unable to recognise the dogs as friendlies and so stampeded ahead of me hemmed in on the narrow track. We all got to the point it opened out onto the hill and as if by magic Mad Keith was perched on a rock watching the pantomime unfold. "Hi Keith, don't suppose you have seen two horses run through have you?" "Yes, just now, they're up there" he pointed further up hill. Great. I increased my pace, so did the tidal wave of sheep before me. Seven dogs ran amok on the hill looking for geriatric rabbits. I shouted over my shoulder, "Was one a white one?" Mad Keith thought a moment before shouting back, "No. Brown I think"
Half a mile ahead the track split in two, if I didn't head the horses off at the pass they would either head back around the hill or head off into thousands of acres of wilderness. I broke into a jog, unhelpfully so did the sheep. The torch illuminated a horses backside running ahead of the sheep, the panic of the sheep spreading to Apollo. William was just trotting along enjoying the adventure. Unbelievably the whole procession was brought to a sudden halt by the two Berners running back towards us having overtaken us all in the darkness. The sheep formed a defensive circle and Apollo skidded to a halt. I caught up with him, put a dog lead around his neck (it being the first thing similar to a lead rope I could find, be prepared, that would be a good motto to live by) and turned for home. He was exhausted and shuffled along by my side alternately leaning on me for support or dragging his hooves a pace behind. William followed like a naughty child trying to pretend he wasn't really following and the sheep not wanting to miss out on anything fell in behind him. And so this convoy of animals made its way back around the hill to Rock HQ. Right on cue as we got to the boundary of The Ghost House Apollo froze and refused to move freaking us all out. I had to drag him whilst at the same time conforming to the legend, don't look back. Eventually we all got back to the safe glow of the anti aircraft lights and the two naughty boys were shut in their stalls without a goodnight story. This little escapade seriously ate into the time available for redecorating so Tracey will have to make do with just a tidy house on her return tomorrow. What of Trevor and his fat balls? Well the little shitland has made the most of his latest eviction from the stable block. The trees in the garden are adorned with fat balls for the birds. Little Trevor has managed to find all these bird treats and eat them all. I am expecting his latest offerings for the garden to pop out strung together in green nets. A busy day at Rock HQ and we have a new arrival called Bailey. Poor Trevor has been evicted from his stable as the easiest option when we got back from work was to put Bailey in the small stable until we can spend some quality time with him to see how he reacts with other animals, particularly cats. 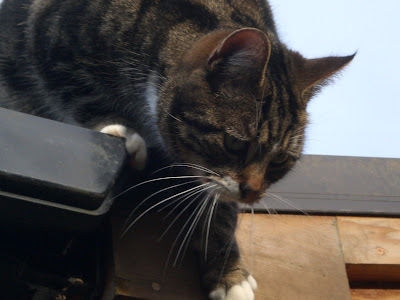 They did meet briefly and the explosion of cat fur and hisses did give some indication of the cats view of a large brindle greyhound visiting the smallholding. 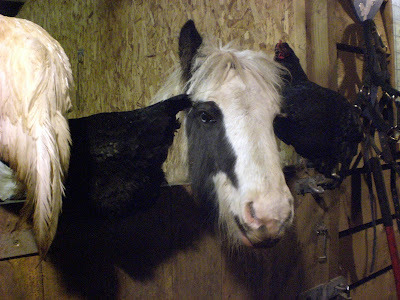 Apollo watched it all from his stall with his posse of hens and Budge his pet cockerel. The Berners greeted Bailey as they greet everything, with the Berner Bounce. All parties signalled a state of truce by frantic tail wagging. Faith on the other hand careered around like a mad thing and if she could talk she would have been yelling "There's a new dog in there!" This went on for what seemed like ages until in a spectacular impression of Jack Nicholson from The Shining she threw herself at the stable door to get in. Had she got an axe she might have made a better job. Bailey remained calm and unimpressed by this display and after a quick inspection of the "kennel" settled down for a bit of a nap. Poor lad has been in the dog pound, today was judgement day, day 7, no home means they have to be destroyed. 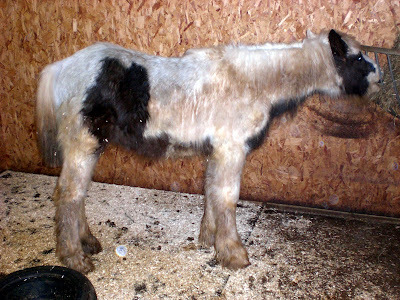 We are fostering him for Hereford and Worcester Animal Rescue until they find a new home for him. He is a lovely dog, obviously been well cared for but no one has come forward to claim him. He was just called greyhound until six this evening when Tracey christened him Bailey. He has shown some signs of being very affectionate, trying to be a scarf to Tracey on the journey home. Apparently greyhounds are very placid and calm critters so hopefully some of that will rub off on Faith! Black Panther spotted in stable! This is Ebony, the "Black Panther" that frightened the hikers. Two very excited walkers stumbled into our yard yesterday, they were the friendly type who like to talk, the type we like. They were dressed for the arctic weather and I had seen them a few days before walking through. Anyway they were very keen to talk to Tracey and were enthusing about what a lovely House Rock HQ was. I on the other hand was preoccupied with the lack of water supply and might have taken an alternative point of view to theirs as I pulled yet another bucket of ice cold water from the well. After extolling the virtues of self sufficiency they moved the conversation on to our sheep, what type were they they enquired, South Downs? No, Tracey explained they were Ryelands, the old Hereford breed, the hikers nodded in approval and then told her what had happened when they had walked by a few days ago. They had wandered into the Cauldron and had a bit of trouble like so many do finding the path. Away in the distance they spotted a black shape creeping through the undergrowth. Unable to gain a proper perspective due to distance and the winter mists they thought they were looking at a large black cat. Their hearts started to beat a little faster as they remembered the legend of the hill, that of a large black dog stalking for eternity, the one Conan Doyle based his book on. All the time the beast was getting closer and picking up speed, obviously making its way towards them. Feeling somewhat threatened they huddled together and backed away intent on returning to Rock HQ to seek sanctuary as they were now convinced they were being confronted by a Black Panther. Ebony our coloured Ryeland had seen them and perhaps sensing a free biscuit or even a sandwich she was keen to engage the walkers. Panic over they dutifully fussed over the less than vicious sheep and carried on with their walk. It would be hard to imagine any creature less Panther like, but its good to hear that one of our flock has added to the legend of the Beast of the Hill. Some would say the difference between Professionals and Amateurs is the amount of training undertaken before they are qualified to take on a task, others that its the difference in cost, Professionals charging a lot more than Amateurs to carry out any given job. My definition of the Professional is the tools they take to do a job as opposed to those taken by an Amateur. 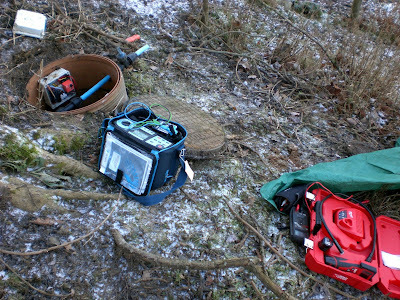 Which is why, today, Steve the electrician turned up to fix the water supply, or lack of, at Rock HQ with a blue box of tricks, an amazing utility belt, a roll of screwdrivers and accessories that would put a safe cracker to shame and a remotely operated pinhole camera. He also learned from last nights visit and brought an anti dog pooh blanket. Me, I turned up with an orange handled hammer liberally coated with rust. 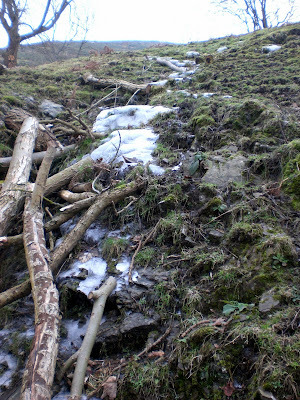 My contribution to the delicate task ahead can be seen in the twigs at the top of the photo. Having achieved Professional status by his collection of toys Steve aka Inspector Gadget set about finding out why the pump would not. Two hours of grovelling on his stomach he ascertained that the huge box of electrics was far too complicated for the job and bypassed all the spare circuits and wired the pump direct to a switch in the workshop. Hurrah, the pump worked, boooo! it wasn't pumping water as all the pipes were frozen. As it had been minus 8 here overnight this was hardly a surprise. It was good to find the pump working, worst case scenario was that removing the pump would cause the bore hole to collapse, visions of thousands of pounds engineers out here to drill it out again did cause panic for a while but thankfully we seem to have escaped that catastrophe. As Steve was here we decided to take advantage of his gadgets, the bath has leaked for around 12 months so was definitely nearing the top of the to do list. Inspector Gadget set about the floor boards with his super duper power saw after a quick recce with the camera. Soon half the bathroom floor was neatly stacked and the leaky pipe sealed. Cheers cheers. Professionals we salute you. Left to my own devices I tried to think of a way to get the now activated pump pumping water to the reservoir and so into the cottage. Armed with a bright red hot water bottle, which contrasted nicely with the hammer I placed the hot bot on the pipe. Plan. Melt the ice in the pipe, have the pump on, pressure of water would eventually shift the ice and water would come out of the overflow tap. Place pipe on tap, run pipe overland uphill to reservoir as underground pipes obviously frozen. Not until it was dark. Tracey came in from the evening rounds saying that she had heard a strange hissing sound. Far too cold and early for snakes so it had to mean that the pump was at least doing something. I went out into the dark armed with a small and very Amateur torch. In its lack lustre beam I could see water jetting out from the tap on top of the bore hole creating a wonderful ice slide on the hill being used by Ryeland sheep who thought a whole new leisure centre had been opened just for them. I removed thirty metres of unfrozen overland pipe from the stream and dragged it up the ice slope to the water jet, joking as I did that when I get there I would find the pipe I was carrying was 20mm and the pipe it needed to connect to was 25mm. Many a true word spoken in jest and by the light of a fading torch I fought the water pressure and managed to cobble a connection, luckily the 20mm pipe has a 25 mm sleeve and with a few sharp blows of my trusty orange rusty hammer the two pipes were persuaded to join and the bruising on my hand was a mere inconvenience. Tap full on Tracey shouted that the Heath Robinson repair was in fact working, the reservoir was filling. What was even more amazing than the plan actually working was that the water from the bore hole was hot, warm enough to bath in. So now we are safe back in Rock HQ, the tanks are filling, water is starting to dribble out of the taps, a funny colour but easier to access than dragging it from the well. People often ask if we will ever run out of things to write about on Tales From The Rock. Well given events like this morning I really don't think we will. This is Sara, a friend of the rock, you can link to her site by pressing the buttons on the margin, anyway she left early this morning, or tried to. 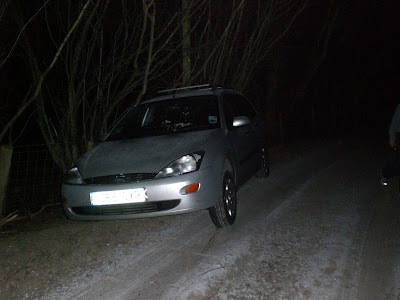 For some inexplicable reason she reversed down the ice slope of a drive and into the ditch, narrowly avoiding a serious impact with our electric supply. 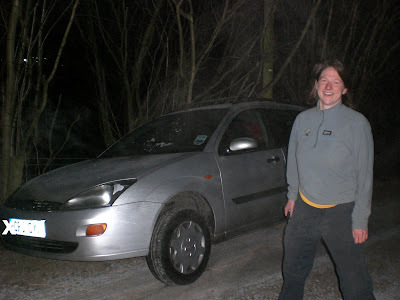 So with me sat on the bonnet to put more weight on the front wheels and Tracey pushing from behind this is Sara's idea of driving gently out of the ditch. 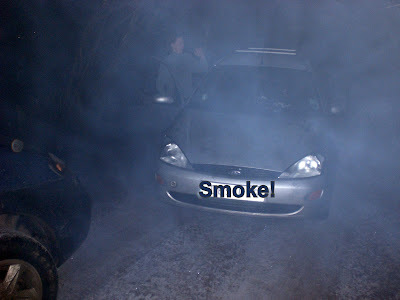 She emerged resembling a Led Zepplin stage effect, all the smoke is from whats left of her tyres.